Facebook is a very attractive advertising platform for marketers. With tons of data collected from roughly 1.7 billion active users, Facebook should be able to target us pretty well with all the dirt they’ve collected on us, right? Facebook relies on information from our Timelines, keywords from Pages that we like, apps that we use, and ads that we have clicked on. While at first this may seem like a positive, this is really where we run into issues. I think that we can all recall a way that we may have misled Facebook once or twice. Remember that time you clicked on an article of an opposing political stance that you don’t agree with? Or watched one of those quick cooking videos, even though you can’t even be trusted with the microwave? And how many of you have gone back and updated pages that you liked back in high school and college? Facebook still believes that these are interests of yours. 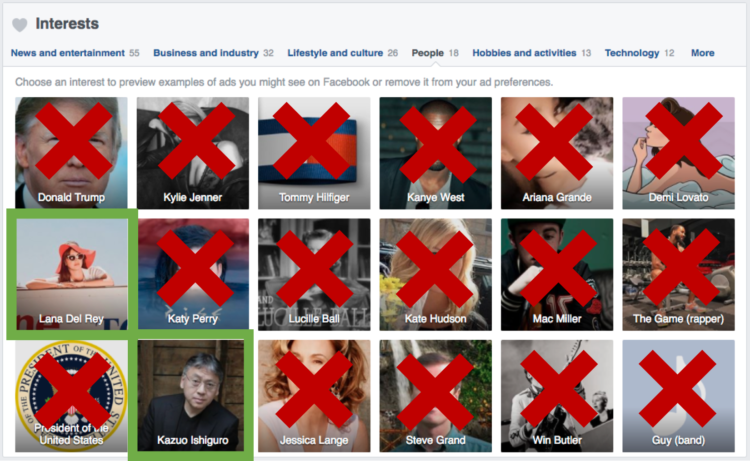 So how well does Facebook know your target users’ interests? And how do we use Facebook Interests to target ads effectively? These are the questions I will try to answer. As advertisers, we don’t want to waste our time and money targeting uninterested or less relevant users. So let’s see about how accurate Facebook was at understanding my interests. As you can see, Facebook did not do so hot. Out of the 18 people Facebook thought I was interested in, only 2 of them were what I would call “true interests”, or interests that I would say actually define me as a person. For instance, Lana Del Rey is my favorite musical artist and Kazuo Ishiguro, my favorite author. After scourging through the rest of Facebook’s suggested interests, only 29% of the total were made up of these true interests. Unfortunately chalk, psyllium seed husks, and manorialism did not make the cut. If you spend some time digging around with your own account, you will probably come to the same conclusion as myself: Facebook is not that great at understanding your true interests. It is cluttered with either off-the-wall interests or include hobbies that everyone should be interested in, like bathing. But just because it can’t write your dating profile, doesn’t mean that it cannot be useful for advertising. It is all about how you use the tools given to you. So how do we use Facebook Interests for targeting, if they don’t always reflect these true interests? Carefully, that’s how. You need to think critically about who you are targeting, and maybe more importantly, who you are not targeting. What I mean by this, is that you need to understand who/what your target market is interested in that nobody else would likely be interested in. Many of the people that Facebook thought I was interested in were people that are known by many, which Facebook most likely attributes to many Facebook accounts. You want to make sure you are not including these types of interests when you are targeting audiences, because it will lead to unwanted clicks. So let’s set one up one together; let’s say we are a board game company looking to advertise a new game that we have coming out. The new board game is horror-themed and I want to make sure my audience would be interested in both topics. Ash Williams from the Evil Dead series is a well-known and loved character in the horror genre. This makes him a great choice to focus on, as fans of horror are much more likely to have him as an interest on Facebook. By including the Narrow Audience feature, I can include a second topic that the audience must share an interest in, which can be more broad if your first interest was narrow. I chose the Board Games interest to hopefully cut out the horror fans that are not interested in board games. With only these two options I was able to narrow Facebook’s 1.7 billion users down to 3,500 people, who are likely to be interested in my product. Depending on my goals, I could switch Ash Williams for another horror icon or choose a specific board game to further narrow or slightly broaden my audience. I did not choose the Horror/Scary Movie interest, because even when paired with the Board Game interest, it is still too broad an audience. Leaving it this way might be including people who posted once about playing Monopoly on Thanksgiving and was dragged to see the most recent horror flick, even though they hate horror movies. I went this route because I am not as picky about where they may get their PPC advertising news, only that they are interested in PPC; I could add even more if I wanted to. Furthermore, I added AdWords as another interest that they must have to help ensure that I am reaching the target that I want. As you can see, I could continue to narrow further if I felt like my Potential Reach was too broad. What tools are they using? Who are thought leaders in the industry? What different books/magazines/blogs do they read? What are popular events do they attend? Who are admired figureheads/celebrities/athletes that would be unknown to most? As you start coming up with different ideas, always ask yourself: would anyone outside of my target audience also like this? If the answer is yes, try to think of a more exclusive interest to target. After you get a few good ideas, remember to pair them with Facebook’s other targeting options for the best results. Good luck and happy advertising!